2. Fry green tomatoes and see what all the fuss is about. Slice tomatoes about 1/4 inch thick, dip them in buttermilk and coat with cornmeal. Using enough vegetable oil to cover the bottom of a pan, fry the tomatoes until they're lightly browned on both sides. Drain on paper towels and enjoy! Combine the spice mixture. Using sterile glass or plastic storage containers, alternately layer the tomatoes and spices. Combine the vinegar, sugar and water and bring to a boil until the salt and sugar are dissolved. Cover the tomatoes with the liquid. Refrigerate for at least 6 hours. Enjoy for up to two weeks, if they last that long! Fascinating! How in the world does setting a banana next to unripe tomatoes make them ripen faster? Excellent question, Marc. Bananas release ethylene, which helps speed the ripening process. 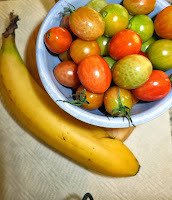 The tomatoes will also ripen on their own, without the banana.